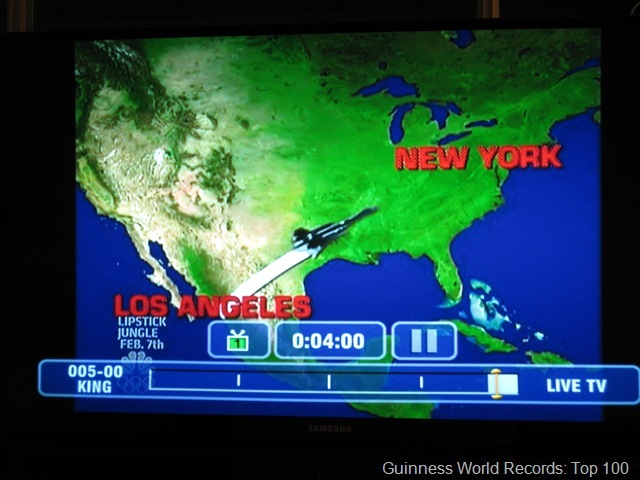 I turned on the TV tonight, and the Guinness World Records: Top 100 show happened to be on. As I turned it on, record #62 came up: fastest flying manmade object. They claim it was the SR-71 Blackbird at 2200mph. I can’t help but think of the X-15, breaking 4,519mph. It’s so bad I had to get out Diann’s camera and snap a picture. I’m trying to come up with something sufficiently snarky to say about this, but I think the image speaks for itself. At least they got New York approximately right. Looking back, I do find it ironic that just below the words "Los Angeles" is the little advertisement for NBC’s new show Lipstick Jungle. Special.